Professionals check on clients by visiting them at home for a variety of reasons that run the gamut from a nurse monitoring the vital signs of an older adult released from the hospital to a social worker assessing the safety of a foster parent's home. However, the National Home Visiting Resource Center (NHVRC) compiles data on a specific type of home visiting—namely that which provides support and resources to families in the prenatal through early childhood stages of a child's life. The data tracked are those of social workers, nurses, and other qualified professionals who follow evidence-based models—such as Parents as Teachers, Nurse-Family Partnership, and Healthy Families America—to provide support and coaching to parents through planned, regular visits. While home visiting's history spans more than 100 years, what is known as modern home visiting has emerged in the last few decades, says Allison Meisch, PhD, NHVRC's deputy project director. "Although the field of home visiting has been evolving over the last several decades, the resource center is new," adds NHVRC advisory board member Lesley Schwartz, MSW, LCSW, ACSW, project director of the Maternal, Infant, and Early Childhood Home Visiting Program for the Illinois Governor's Office of Early Childhood Development. Schwartz notes that home visiting has garnered attention in recent years. "Home visiting used to be a hidden gem," she says. "People didn't know it was available in their communities." Because NHVRC is young—it was publicly established in 2017—advisory board members such as Schwartz and other experts in the home visiting field were brought on to help shape the organization's direction and to determine, along with funders, resources that would be most helpful to the field. "We do our best to tell stories with data," Meisch says. "Numbers are great, but we recognize that it's the stories of real families impacted that are important." For example, in the video "Somebody in Your Corner" on the NHVRC's website, www.nhvrc.org, first-time mother Crystal Gray of Washington, DC, describes the positive effects of home visiting on her life. "Having home visits and having a family-support worker, it relieves so much stress on things that you didn't know how to do, how to accomplish," Gray says. She goes on to say how her daughter has benefited. "She's happy," Gray says. "So now I see her with a smile on her face." The video is only one type of item featured on NHVRC's website, which offers a variety of other resources, including stories, research studies, briefs about innovations, data profiles, and a reference catalog. Those interested can subscribe to an NHVRC newsletter, which, Meisch notes, is not a best-practices or practitioner-based guide but, rather, is more focused on administration. While the main audiences are home visiting administrators, state administrators, and program administrators, the information amassed by NHVRC can be relevant not only to social workers who are providing home visiting services but also to social workers who are referring clients for such services, Meisch says. Every social worker should know about the benefits of home visiting for children and families, Schwartz maintains. "To some degree, all social workers are interacting with families, so even if their specialty isn't expectant mothers or children under 5, they still, in their practices, are going to come across this [home visiting]," she says. "It's absolutely important for a social worker to know if home visiting is offered in their community and to help families access it." The information NHVRC shares serves social workers from the micro to macro level. 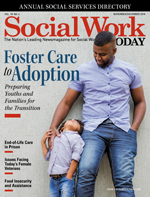 "For the social worker who knows about home visiting and is steeped in the early childhood field, they can use it to advance their knowledge," Schwartz says. "What I find about the website is that it can help on the ground for the practitioner who is providing services or supervising to someone who is at the policy level and wants to advocate for home visiting." Until NHVRC's first yearbook published in July 2017, no comprehensive source of national home visiting data had existed in one place, according to Schwartz. "The 2017 Home Visiting Yearbook," an online publication, featured 2015 data. In January 2018, NHVRC published an online data supplement to the home visiting yearbook that featured 2016 data. Part of the project's challenge is the complexity of tracking data. "Even within states, most states don't have one system that tracks their data," Meisch says. The data have improved and become more streamlined each year, Schwartz says. "So stay tuned as the years go by," she urges. The yearbook currently offers an overview of home visiting—a definition, history, supporting evidence, and various models. Statistics are provided for each state and tribe. Data about specific states include the number of families utilizing services, the models being followed, and the type of families benefiting, as well as those who aren't. Hyperlinks take users to other organizations' websites for further information. "We look at census data to see how many more people can benefit [from home visiting]. We know we're not reaching everyone," Meisch acknowledges. "We pull two different data together: who's being served and who could be served." Schwartz says the organization plans to expand its home visiting research library. A goal is that keyword searches will yield lists of results for specific home visiting topics. • "Evidence-based home visiting was implemented in all 50 states, the District of Columbia, five territories, 25 tribal communities, and 53% of U.S. counties in 2017." • "In 2017, more than 300,000 families received evidence-based home visiting services over the course of more than 3.5 million home visits." • "An additional 28,700 families received home visiting services through nine emerging models that do not yet meet standards of evidence as determined by the Home Visiting Evidence of Effectiveness project. These nine models provided more than 400,000 home visits in 2017." • "About 18 million pregnant women and families (including more than 23 million children) could benefit from home visiting but were not being reached in 2017. These numbers have held steady since 2015." • "Since its inception in 2010, the federal MIECHV Program has strengthened home visiting by supporting services, research, and local infrastructure. MIECHV expired in September 2017 but was reauthorized in February 2018 for an additional five years." • "In 2017, MIECHV helped fund services for more than 81,000 families in states, territories, and tribal communities—a portion of the total families served by home visiting that year." • "States continue to support home visiting by combining funds from tobacco settlements and taxes, lotteries, and budget line items. With limited resources, states are working to expand the reach of home visiting and serve as many families as they can in a way that makes sense on a local level." NHVRC is funded by the Robert Wood Johnson Foundation and the Heising-Simons Foundation. National Home Visiting Resource Center. (2018). 2018 Home Visiting Yearbook. Arlington, VA: James Bell Associates and the Urban Institute.